'The Boa' is a Nourbel & Le Cavelier Signature collection. 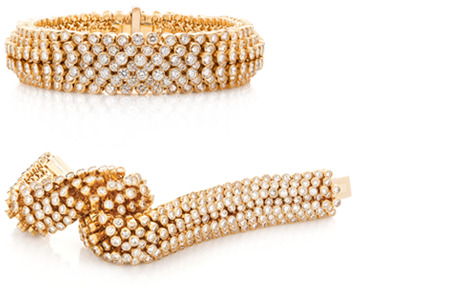 A snake-like sinuous 18k gold bracelet whose coils set with 'sertis-clos' diamonds can be modelled as the wearer wishes. The Boa exists in 5 or 7 rows, in 18k white, yellow or rose gold, with diamonds or coloured gems. An exclusive design by Nourbel & Le Cavelier, with a unique patented setting.